In this special one-off corner, the hosts talk about (a) which members they’d like to do a shuffle unit with and what song they’d like to sing with them, or (b) what kind of a shuffle unit they’d like to see other members do. Suzuki’s dream shuffle team would consist of Ishida Ayumi, herself, Takeuchi Akari and Katsuta Rina, and she’d like to sing “The Peace!” with them. She thinks this song would be really fun to do especially since it has the spoken word part which, of course, she’d want Take-chan to do. 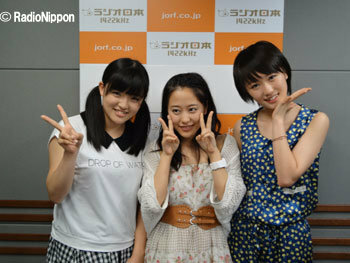 Kudo would like to sing “DON’T STOP Renaichuu” together with Yajima Maimi and Miyamoto Karin. Oda calls it a pretty unexpected song choice. She’d want Yajima to have short hair like in the “Campus Life” music video, and she just thinks it’d be a fun song to do with the three of them. Oda’s shuffle unit would have Fukumura Mizuki, Sugaya Risako, Nakajima Saki, Takeuchi Akari and Miyazaki Yuka doing “I & YOU & I & YOU & I.” Suzuki calls this a pretty rare lineup, and Kudo announces that Oda’s selection just got a round of applause from the director of the show. She says these members all have really cute speaking voices, naming Risako first — she’d want her to sort of whisper her vocals on this song. The three do rock-paper-scissors as to which of the songs to play on air. Kudo wins. Oda sends a final message over to Nacky at °C-ute na Jikan, reiterating her hope that she’d like for her to sing Tanpopo’s “I & YOU & I & YOU & I” and asking if she herself would like to sing it, too. Oda: Join us on Morning Jogakuin again next week! Oda & Suzuki & Kudo: See you again! Do they really say this s–t?